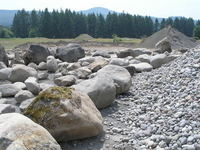 From the heart of the Willamette Valley come these natural river boulders in gray & buff hues. 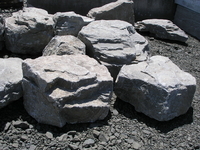 The material of choice in our region for landscape accents, water features and dry creek beds. 18" plus up to 6 feet! 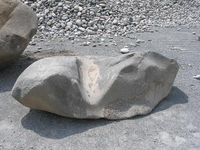 These boulders are stocked in all our yards or are available shipped to you direct from the quarry in 12 ton minimum up to 30 ton maximum loads. For large projects, this can be a very cost effective way to purchase this material.